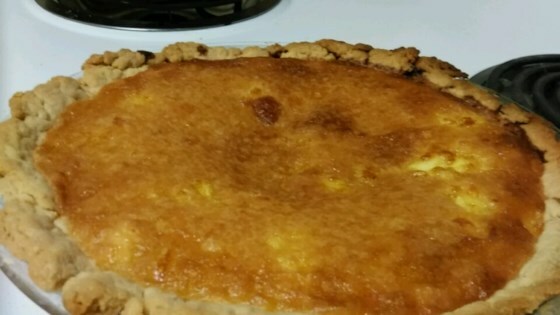 "This pie is very rich, and has been in our family for many years." In a medium bowl, beat eggs well. Mix in sugar and margarine. Blend in vinegar and vanilla extract. Pour filling into pie shell. Bake at 450 degrees F (230 degrees C) until pie starts to brown. Reduce heat to 350 degrees F (175 degrees C), and continue to bake for about 25 minutes. I was looking for a recipe that my grandma used to make. This was it to a "T"!! Like pecan pie without the nuts. VERY sweet but GOOD!! Takes literally 5 minutes to prep. So easy!!!! I lost my recipe for transparent pie and this tastes just like it. Some recipes call for cream, but I like this version, just like my mom and grandma made! Was a bit too eggy/custard like. In the future I'd use 2 whole eggs & 2 egg whites, plus make sure the vinegar is evenly distributed without so each bite is more uniform.